Uriah Hunt Painter (photographer), “Waffle Vendor on the Mall,” Histories of the National Mall, accessed April 25, 2019, http://mallhistory.org/items/show/505. Much like the food trucks that line the Mall today, food wagons in the late 1800s catered to office workers and tourists. 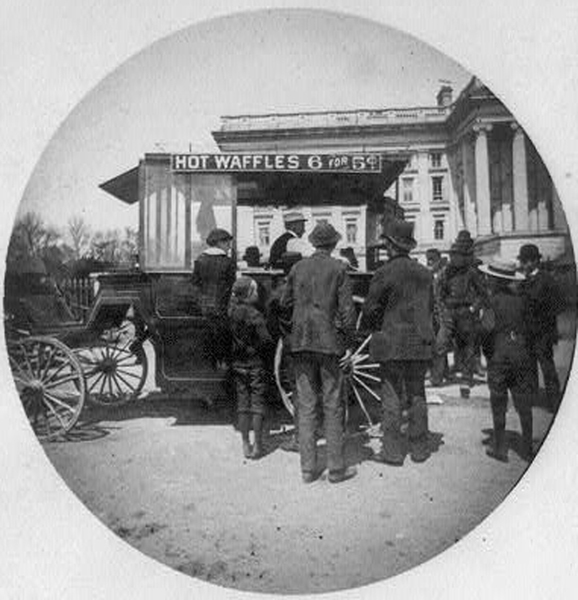 Here a wagon offering "Hot Waffles 6 for 5c" sits on the Mall near the southside of the Treasury Department building.